ErnestHemingway is a Legacy Library. Legacy libraries are the personal libraries of famous readers, entered by LibraryThing members from the Legacy Libraries group. » Ernest Hemingway's legacy profile. ErnestHemingway is also an author. 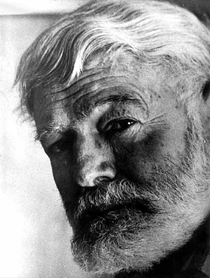 » See Ernest Hemingway's author page. About meI won the Pulitzer Prize in 1953 for my novel The Old Man and the Sea and the Nobel Prize for Literature the following year. "I'm always reading books--as many as there are. I ration myself on them so that I'll always be in supply." - from an interview with George Plimpton in The Paris Review, Spring 1958. "He read everything.... he would have a whole group of books going at one time, eight or ten.... he would put one down and pick up another." - Tillie Arnold, family friend and author of The Idaho Hemingway. About my libraryBy the time of my death in 1961 I had amassed over seven thousand books in my various homes. The long, long list has been input by my fans on LT, working from Hemingway's Library, the comprehensive list compiled by Dr. James D. Brasch and Dr. Joseph Sigman of McMaster University, and provided online through Boston’s John F. Kennedy Library, here. Also included in my library: the first editions of the books I authored (Drs. Brasch and Sigman note over 200 copies of my own books in my collection, but give no details). Part of my library at the Finca Vigía. For in-depth details on my libraries in Key West and Cuba - and my book obsession - see the introduction to Hemingway's Library. Tag along on a visit to my home in Key West here, and for a report on the current state of my Cuban library, see Adrian McKinty's article in the London Times, "Any Book in Hemingway's Library, $200". My reviews of books and writers can be found in Ernest Hemingway On Writing, edited by Larry W. Phillips. Works and page numbers cited with quotes are from the Scribner paperback editions of my works. A note on my favorite authors: they were added based on the information in Brasch & Sigman's introduction.